The warm sun on my face was a welcome change from the biting chill our damp weather has been treating us to lately. I had to travel a bit to find this comfortable refuge, but the trip was well worth it. Below my viewpoint, a big muddy river flowed to the sea, carrying the flotsam it had gathered from its low water banks. Logs and bits of driftwood spun and danced in the current like small boats without a rudder. Eventually they will come to rest in a collection of woody debris far above the normal waterline inviting speculation for those unaware of the early season activities of their favorite stream. A manmade object comes into view and I am reminded of Huck Finn’s adventures on the muddy Mississippi. This raft has lost its captain and travels without direction except for that supplied by the churning waters. 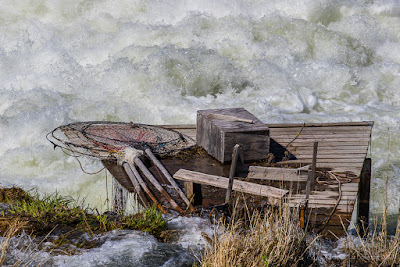 As it comes closer I realize the original purpose of this craft was to hold its occupants high above the river as they dipped their nets for Salmon. No Salmon will lay on its weathered deck this season. It now belongs to the river and travels at the whim of the currents. I am witnessing the river in transition. A seasonal cleansing of its banks and bottom as melting snow and rain flood the arteries that feed it. This lifeblood restores and invigorates the river, helping to undo some of the damage done by man and nature. It may change the familiar look in places and require us to relearn some of its secrets. No matter. In time the receding waters will unveil this refreshed and renewed stream and we will again explore her banks and riffles. It’s the nature of things to change, and now we wait to see what those changes are.